Charleston Historic City Tour is no longer available, it is unknown if or when it may return. Explore the oldest city in the state of South Carolina with this Charleston Historic City Tour in order to explore the city's gorgeous architecture and rich history that dates back for centuries. This 1.5-hour tour will provide you with an excellent opportunity to see the sights of Charleston. Explore the city in your comfortable tour bus with rich narration about the history and culture of the city, as well as several amazing stories about famous historical figures who have lived or passed through the area. With this tour, you will have virtually unrestricted access to Charleston's Historic District as you explore some of the city's most beautiful, antiquated mansions with the opulent and lush garden areas. See centuries-old churches and listen to stories about the people who frequented them, and stop at the Battery, a landmark promenade that is known for its antebellum homes and stately gardens. Meet your tour at the Charleston Visitor Reception and Transportation Center, where you can enjoy access to a gift shop, brochures and information, and a film that will introduce you to beautiful Charleston, South Carolina. 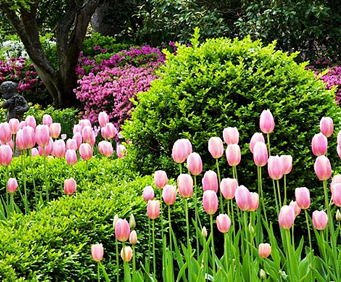 No trip to Charleston is complete without a stop at White Point Gardens, known popularly as Battery Park. This peaceful park offers unprecedented views of Charleston Harbor and Fort Sumter, while a look back across the street promises fantastic images of beautiful Charleston mansions. Located between North and South Market Streets in the Historic Downtown area, the Old City Market offers guests to Charleston first-quality goods. With well over two centuries of history in the city, the market is now a favorite spot for tourists and visitors to peruse the goods of more than 100 merchants in four open-air buildings. 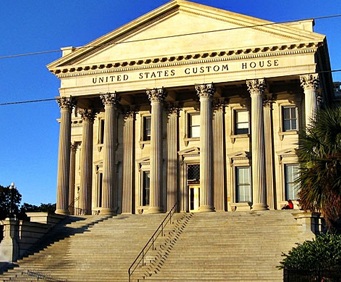 Located in Historic Downtown Charleston, the College of Charleston was founded in 1770 and chartered in 1785, making it the oldest college or university in South Carolina. Founders of this college include three future signers of the Declaration of Independence and three future signers of the United States Constitution. As Charleston was a walled fortress city between the years of 1690 and 1720, in fact the only English walled city in North America, visitors now have the opportunity to see parts of the Original Walled City throughout the entire city. Explore one of Charleston's most recognizable districts at the vibrant Rainbow Row, a unique stretch of mid-1700s homes and buildings. These homes, once the center of Charleston's commerce and retail district, underwent significant renovations in the 1930s and '40s, offering visitors vibrant shades of pinks, yellows, and blues. During your tour, you will have sights of this beautiful harbor, formed by the junction of Ashley and Cooper Rivers. 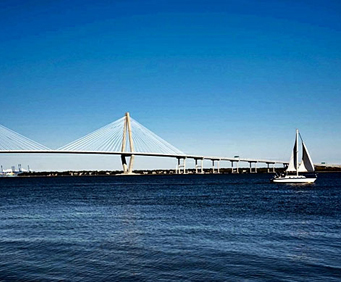 Take in sights of the beautiful water, pelicans and dolphins, and the architectural wonder of the Arthur Ravenel Jr&period; Bridge. The H&period; L&period; Hunley was a submarine of the Confederate States of America during the Civil War, and she demonstrated the advantages and dangers of undersea warfare, as she was the first combat submarine to sink a warship, although she was then lost. Located in 1995 and recovered in 2000, Hunley is on display at the Warren Lasch Conservation Center, along with artifacts that suggest her close proximity to her target cause her own demise. As one of the six Senior Military Colleges in the United States, The Citadel was founded in 1842 and is accredited by the Southern Association of Colleges and Schools. Originally constructed as an arsenal, The Citadel has a rich history and has played a role in the Mexican-American War and in the Civil War. This tidal pond, known as Colonial Lake, and the surrounding area, which was developed in the 1880s, is used as a park. Acquiring the name Colonial Lake in 1881, this scenic man-made pond in downtown Charleston is a popular place for walkers and joggers, and its history does indeed go back to colonial times. The Charleston Historic City Tour provides your family with the perfect opportunity to learn more about the incredible history of this fascinating city. The guide was very personable, helpful, and he had good knowledge of the history of charleston. The tour was great. The tour guide was very knowledgeable and gave a really great presentation on charleston's history. The tour covered the downtown area and all of the historic homes. We did change from the booked tour to one with grey line tours as we were the only two booked for the other tour and our driver arranged for us to go on their tour bus. It worked out just fine and the driver took us to the ft. Sumter drop off site and picked us up and took us back to the visitor's center after we visited ft. Sumter. This was way above and beyond what we had paid for on the original tour. I would highly recommend the grey line bus tour. They are really great and went way out of their way to accommodate us. The guide took such care to be sure the group could see each site with enough time to absorb the info he was sharing.